My Son has just written here a wonderful Blog about Ronald Lee who had been a major influence on his musical, intellectual and personal life. It was a very moving piece that set me thinking about the importance of the influence of others in our lives. I refuse to use the term 'role-model' as it has been so de-valued today. Why on earth actors, models and professional sports people should be seen as role-models is beyond me. They live in a different world to the ordinary man and woman in the street. There are of course many people who have had an influence on my thinking through their writings, speeches and way of life. People such as Mahatma Gandhi, Dr Martin Luther King, Nelson Mandela, and more recently Jean Genet. However, these are people who have influenced from a distance; what of those I have known personally, and been influenced by them? Before coming to that, I wonder whether I, after a life-time of work, have had a positive influence on the life and work of others? Only others can answer that of course, and it would be rewarding if the answer was yes, but disappointing if the answer was no. The truth is that I'll probably never know. It has been a humbling exercise to try and come up with names of those who have been influential in my life, and perhaps not surprisingly the list is very small. There have been those I've met who I have admired and respected greatly, but this is different from having a personal, positive influence on me. In the end I've settled on one person, Minnis Mills. 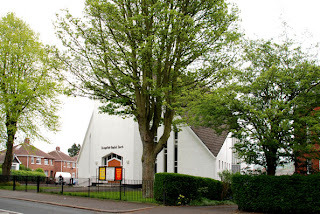 In 1970, I moved to Belfast with my wife to study theology at the Belfast Baptist College, and we started to attend Orangefield Baptist Church, which was the nearest Church to where we were living. (Picture at the top of this Blog). The Pastor (Minister) was Minnis Mills. As far as I can tell, he was born in Belfast in February 1904, and became an Accountant. I believe that he may have founded the Orangefield Church, but I'm not clear when. The Belfast Telegraph has a wedding notice saying that Pastor Minnis Mills conducted the service at Orangefield Baptist Church in August 1947. So it was at least in existence just after the war. 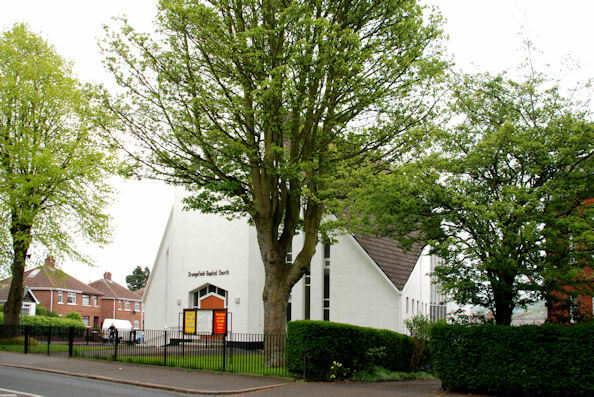 The current building was opened around the middle to late 1960's, and its design was in stark contrast to the rather bland Baptist Churches in existence at that time. I was later to become Pastor of this Church for six and a half years from the late 1970's to early 1980's. Minnis Mills was a short, thin man, who was always immaculately dressed. If he wasn't in a suit, it would be a jacket and trousers, and always with a tie. Even when dressed up, I could never look as dapper as him. His manners were just as immaculate. The academic year 1971 - 1972 was one that I'll never forget; not because of the constant threat from bombs, bullets and street unrest in Belfast, but because I worked with Minnis Mills. During the second year at theological college, everyone who was training for the ministry was allocated a Church placement to spend the whole year working with the local Pastor, in addition to college work. I was allocated (in fact I strongly insisted) Orangefield Baptist Church under the guidance of Minnis Mills. It was a wonderful year in many respects. Here was a man with over 40 years of experience to draw upon, and after listening to some of my fellow students recount their experiences of placement, I realised that I'd fallen on my feet. Minnis Mills was friends with Ian Paisley, and Ian's Father, who had also been a Baptist Minister. He was not a demonstrative preacher; did not shout or walk around like a caged lion; he chose carefully when to raise his voice for maximum affect, and his hands and eyes could tell a story all on their own. He held people's attention by the quality of his words, not through volume or physical activity. He was a kind man who had time for everybody, and though he held to very strong theological views, and could very forcibly put those views over, it was never personal, and was hard to take offence at. As he was immaculate in dress, so he was in words and performance. This was a man worth listening to, and worth following. My privilege was to get to know the public figure, in a personal way. My fortune was also his mis-fortune, as he took quite ill during the year, which eventually led to his retirement. I'd given some thought as to how the year might work out. Occasionally leading and speaking at services on a Sunday and during the week; visiting the sick and meeting with the Pastor to see how things were going. It turned out however to be quite different, and for me, the best experience anyone could hope to have. The arrangement was that Minnis would take a service if he felt up to it, and on occasions he did. However, on many other occasions I would get a call an hour before to say that he was not well enough, and could I do it. It was here that I learned to think on my feet, and to keep a few ideas up my sleeve, just in case. Getting to know him personally was mainly through visiting him at his home, and talking to him for perhaps a couple of hours at a time. 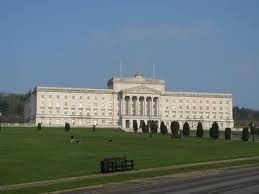 During every visit you were accorded the traditional Belfast welcome from his wife, with the finest cups and saucers, and plates of sandwiches, cakes and tray bakes. I've no idea what his politics were, as we never discussed it, though I suspect he was strongly for the Union. From him I learnt about humanity, and the importance of every human being. I learnt about dignity and humility, though I haven't always manged to live up to those lessons learnt. About three years after leaving theological college, and following a none too successful stint in England, I became his Pastor at Orangefield Baptist Church, a role I felt unworthy to perform, and there's no false modesty intended here. Though a small man, his legacy was huge, but he couldn't have been more encouraging and supportive. He died in 1982, and the loss was immeasurable. What he would think of my current position on religion is anyones guess, but though he would no doubt be disappointed, he would not condemn; he would simply and calmly try to persuade me back to the 'truth'. His eyes would also say it all. My gripe with religion is not to be equated with having a gripe against everyone who holds to religion. People like Minnis Mills show all that is good about mankind, and it was my privilege to have known him, learnt from him, and to have been personally and positively influenced by him.